A remarkable piece of simple engineering, the White Rock Head Tie is a lightweight alternative to a hat. Impregnated with Bug Off technology it repels insects, and has Hydro Cool Crystals to aid with cooling in the heat. 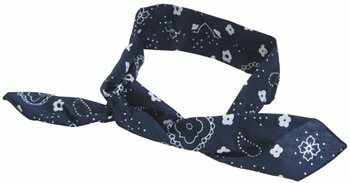 Manufactured from X-Lite Micro Fibre the Head Tie is perfect to help you cool down and as a trekking companion when you don't need the full coverage of a hat. Hello, I really wanted to buy this tie,is there an alternative or will you be replacing it sometime soon?